“It can be difficult as an adult to make friends. The friendships I’ve forged as a member in this club and while doing community service have been great,” Robbin said. Robbin now serves as club president and enjoys leading the club in improving the community. The club’s biggest project is the Elves Gift Shop, where children come in and buy holiday gifts for their families. This event, held every December, raises money for a designated nonprofit in the area. 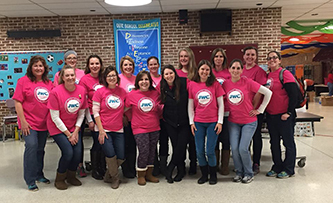 The nearly twenty members of the Junior Woman’s Club of State College are all different ages, with women in their twenties, thirties, and forties. Since its founding in 1955, the club’s membership has fluctuated up and down, but the overall attitude of coming together to make a difference has remained the same. The club is always looking for new members! Robbin says that the club hosts membership socials twice a year, in addition to spotlighting social and service activities so potential members can see if the club is a good fit. “It’s nice for women in our community to get together and do work that supports other organizations that are doing great humanitarian work, and have fun doing it! We celebrate our differences and the things that bring us together,” Robbin said. To learn more about the Junior Woman’s Club of State College, click here. 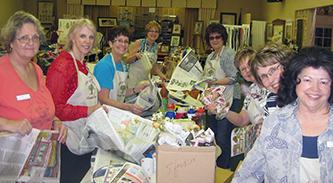 Visit https://www.gfwc.org/who-we-are/club-websites/ to find a GFWC club in your area.